12 Mar 2018 --- Ancient Nutrition, a bone broth protein and collagen supplement maker, has secured $103 million in funding through strategic minority investment led by VMG Partners. The company, which is the breakthrough pioneer in Bone Broth Protein supplementation that delivers the benefits of “homemade bone broth in a convenient, easy-to-mix form,” revealed a minority investment from VMG Partners, Hillhouse Capital, ICONIQ Capital, and over 100 members of a co-investor network. The backing from this esteemed group of industry leaders, influencers, and individual investors is a testament to the future of Ancient Nutrition’s movement towards providing history’s healthiest, real food nutrients to the modern world. This announcement marks the brand’s first investment, which is poised to elevate the current team’s resources and company growth. Bone broth is one of the most trending areas in US functional foods. 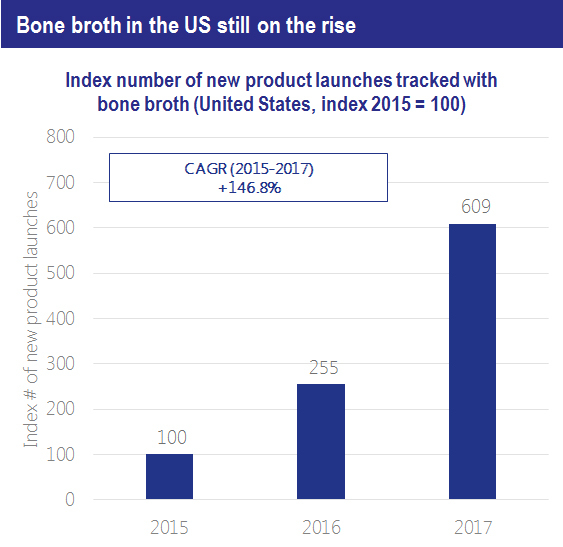 In fact, Innova Market Insights tracked over six times as many products marketed as "bone broth" in 2017 as in 2015, with CAGR of +147%. 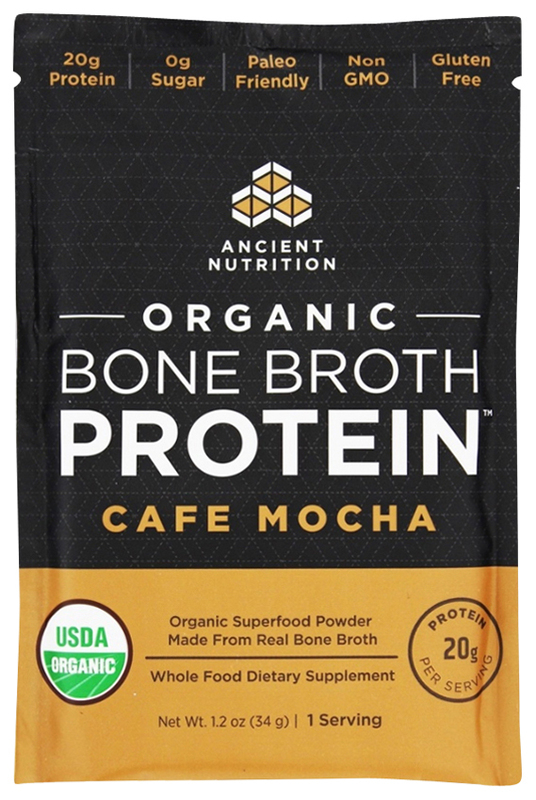 Recent launches include Ancient Nutrition Organic Bone Broth Protein Powder, a Cafe Mocha flavored organic superfood powder made from real bone broth. "It is perfect for those looking for an organic, meatier, thicker and more substantial bone broth protein. Containing a balanced, complete profile of both muscle-building proteins and connective tissue-building proteins, organic bone broth protein is the ultimate source of ancient nutrients." The US bone broth trend is being driven by small companies. According to Innova Market Insights, of the top 100 sales-based companies within the food & beverage space, only General Mills and McCormick have a product with bone broth in the US market. This in itself the result of acquisitions. General Mills acquired Epic in 2016 and McCormick acquired Kitchen Basics in 2011. Ancient Nutrition was co-founded in 2016 by Jordan Rubin and Dr. Josh Axe. Rubin also founded Garden of Life (recently acquired by Nestlé) and is the New York Times best-selling author of “The Maker’s Diet.” Dr. Axe is also the founder of DrAxe.com, the #1 natural health website in the world with over 17 million unique visitors per month, and Axe Wellness, #35 on the 2017 Inc. 5000 list. Ancient Nutrition believes the human body was built for high performance and that in the modern world consumers are often disconnected from the traditions and nutritional principles that were honored and celebrated throughout history. This round of funding represents a vote of confidence for the developing bone broth market. Although still a niche product, bone broth products have seen impressive sales growth in recent years. According to SPINS, US retail sales of bone broth tripled to $19.7 million in 2016. Ancient Nutrition has meaningfully contributed to its recent growth, experiencing a 266 percent growth CAGR between 2013 - 2017 and representing 40 percent of growth for the protein, collagen and gut health category during this period. Other companies in this space include bone broth maker Kettle & Fire and Bulletproof with its collagen powder and recent Whole Foods debut of its ready-to-drink collagen coffee. Ancient Nutrition’s strategic, minority investment is led by VMG Partners, a private equity firm that specializes in investing in and building iconic branded consumer product companies within the food, beverage, pet food, personal care, and wellness categories, including KIND, Quest, Vega and more.